They lever arms inside the latches are 0.070 inch soft steel. The pivots for the lever arms are very crude....no ball bearings..and no bronze bearing sleeves. Just a bare steel punched out to form a bearing sleeve. The grease for the pivots attract dirt, which means were I live ...sand. With age, the sand grinds away at the pivots. At the first instance of binding, if you use force to try to actuate the mechanism, the 0.070 inch soft steel levers will bend. When bending occurs, you're hosed. Of course, if the lever mechanism binds and you can't immediately open the door, it's a PITA to force it open with screwdriver probes. What I'm saying here is to buy new repro latches. They appear to be of good quality. 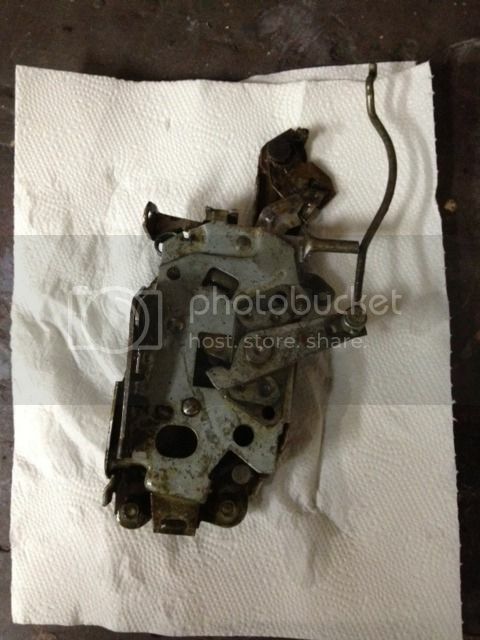 They're not all that expensive, but before you even start to whine about the price, think about us 68 owners.......there's no repro latches available. 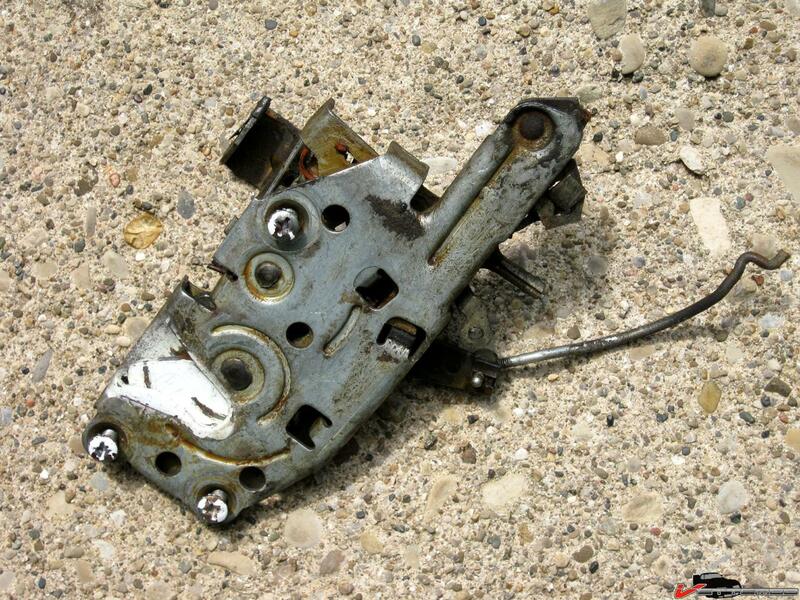 If you have a jammed latch, and it's a 69 latch and above, buy a new repro latch, go forth and be happy. The passenger's door on my 70 failed and wouldn't open. I used the screw driver long plunger method to open the door. 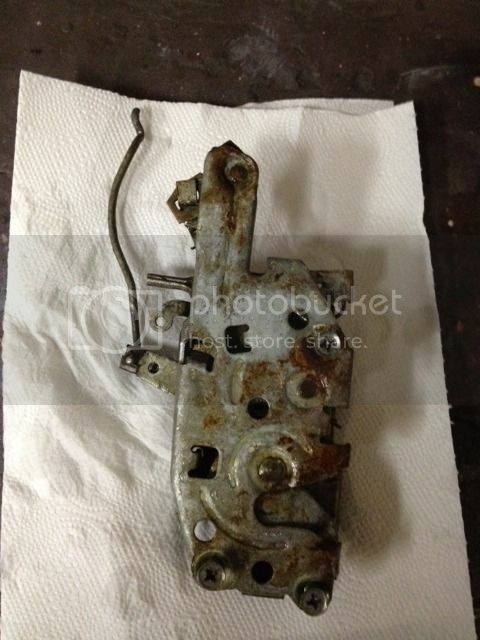 I decided to replace the door latches on both the drivers and passengers side. 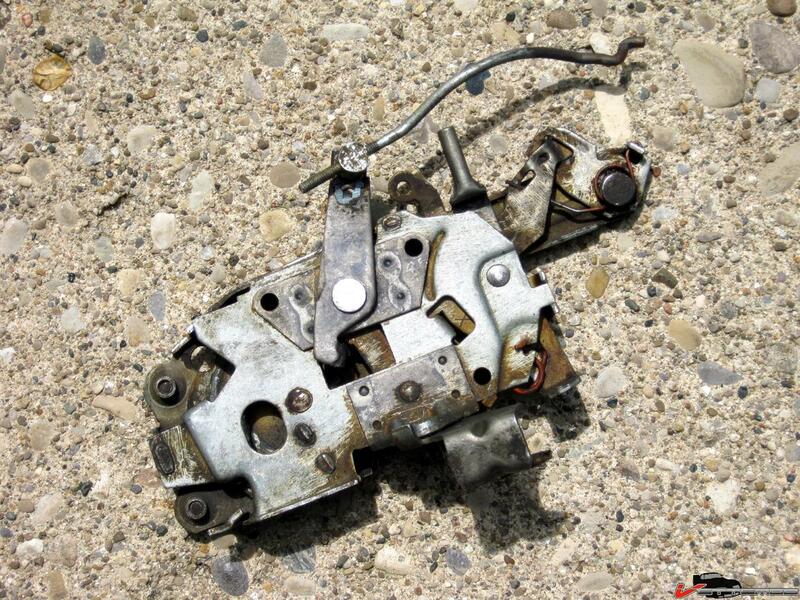 Opening a door when the latch fails is a problem you don't want to ever experience. To use the long screwdriver technique, first open a door that works OK. Take off the interior panel. With the door open and the panel off, you can see what the long screwdriver probe is doing. (The screw driver is to be used as a push tool) Practice on this door. When you've got it so you can open with the long screwdriver,...then go to the jammed door. Long screwdriver.. you don't use the screwdriver to turn screws, you use it as a shaft to trigger the door latch interior mechanism. Last I knew, the 69 and up latches were still available to purchase. Buy one to replace the defective one. Hold the new one in your hand and then practice with that long screw driver (actually just a push tool) to train yourself as to how to open the defective latch. Been there, done that with two lock outs...my 68 and 70. Get back to the forum. There's photos and a lot of discussion on the forum about this issue because it's such a common problem. Last edited by 68/70Vette; 08-10-2013 at 04:37 AM..